The Library hosts a monthly exhibit in our McCarthy Meeting Room and throughout the main floor. Many exhibits kick off with an opening reception or a program related to the exhibit. To have your work exhibited, please review our Art Exhibition Policy and Art Exhibit Application. Questions about the Art Exhibits should be directed to Jeff Hartman, 978-256-5521 x1109 or jhartman@chelmsfordlibrary.org. 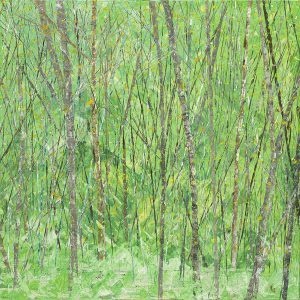 Karen Fieldstad has been creating art for over 40 years, currently living in Topsfield and inspired by the landscape of New England. The style is abstract / impressionist with a focus on nature. 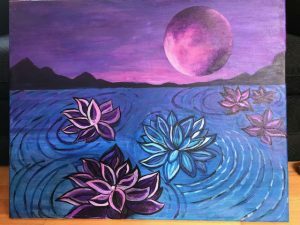 “Art is a meditation for me, a kind of therapy, a journey to a still mind.” Meet the Artist Reception on Saturday, April 13 at 2:00 p.m.
A Colombian-born Chelmsford resident, Mr. Cifuentes works in Boston as a plastics artist and has been a painter for over 60 years. 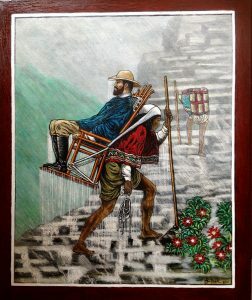 Working mainly with oil on canvas and on wood, he explores various techniques and styles, but returns often to themes inspired by Latin America. Mixed material artwork by children aged 4 to 12 highlight themes of family and growing up. The Chinese Family Network helps to inspire children to understand and appreciate Chinese culture, heritage, and language. 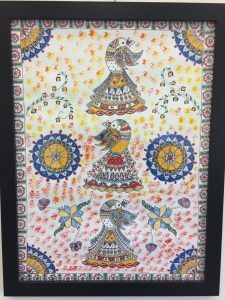 For the last three years, Anindita Lal has studied madhubani art under the instruction of Sunanda Sahay. Madhubani is a traditional technique developed in Nepal and northeastern India. It uses bright colors and repeating geometric patterns to illustrate the relationship between people and nature, as well as scenes from Hindu scripture. 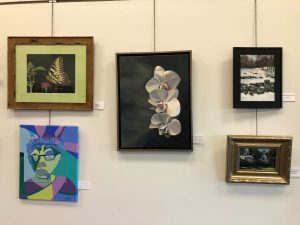 For fifty years, the library and the Chelmsford Center for the Arts have hosted the Chelmsford Art Society’s Fourth of July Art Festival. Visit us to see work in many different media on many different subjects and celebrate at a reception with music and refreshments on Saturday, July 21 at 3:00 p.m.
Fiona Huang is a talented young artist who is looking forward to sharing her work, along with her story and inspiration with the Chelmsford arts community. 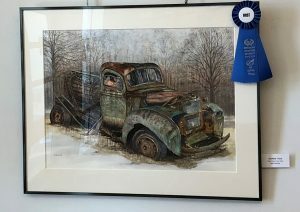 Throughout the years, Fiona has won many awards for her artwork in various art events including the annual local July 4th Art Competition, the Halloween Mask Competition held by the Chelmsford Center for the Arts in 2015, the 2016 Lions Peace Poster Contest and the 2018 PCA Westford Regional Art Event. 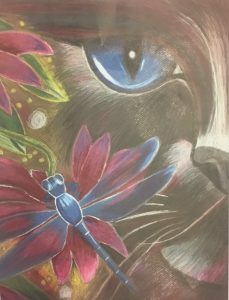 She has also won her school’s 2017 and 2018 “Parker Pride” Poster Contest and her artwork was selected to be Parker Middle School’s 2018 yearbook cover. Stephen Lewis returns to the library with his collection of vintage and newer posters depicting the international struggle for human and labor rights. Mr. Lewis is a proud and active member of Service Employees International Union Local 509 and is supported by Laborers Local 1249 and the Asbestos Workers Local 6. 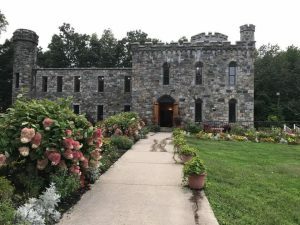 This month’s art exhibit presents the work of the three Artists in Residence at the Chelmsford Center for the Arts. Each offers a unique perspective on the world using different techniques and informed by different backgrounds. 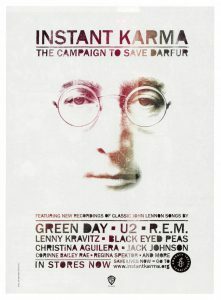 Come and meet them at a reception on Saturday, October 20 and learn more about their work and their lives. For years, Lowell-based photographer Liz Cardosa has journeyed around the world, capturing life in motion in different countries to create the kind of images that convey a story. In 2017, at the age of 41 she traveled to country #41 on her list…the mainland of Portugal. Being of Portuguese descent and feeling a special connection to the country and culture, she decided to document this wonderful milestone by capturing “41” images of life in this European gem. Each year dozens of local artists display their work and share it with the community. 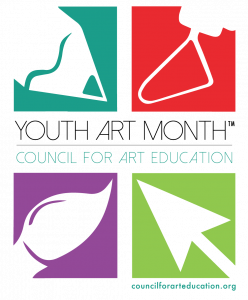 The Chelmsford Art Society promotes the arts through education, networking, scholarships, and moral support from the members. It is a means for making good friends with common interests that will last for years to come, friends who share and understand the issues of being an artist in today’s world. Reception, Saturday, January 12 at 2:00 p.m.
Stop in at the Library for this special Sunday event. The Cultural Council will be holding a reception for their annual Photography exhibit. Winners of the Photography Contest will be announced. Live music by the Doublenecks guitar duo – light refreshments will be served. To enter the contest, download this application and submit it with your entry by Saturday, January 26. Reception, Sunday, February 3 at 2:00 p.m.
We invite you to join us for the annual Chelmsford Public Schools K-12 Exhibit in celebration of Youth Art Month! Enjoy art by our local students in grades K-12. Certificates will also be presented to award winners, and light refreshments will be served at a reception on Thursday, March 7 at 5:00 p.m. In addition to the Library’s wall exhibit space, we also have a display case maintained by the Chelmsford Culture Council. 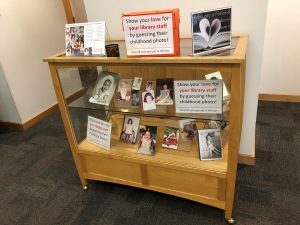 Do you have a display you would like to share with the community? Please complete the Cultural Council’s Display Case Application. The display case was created by James Scarth, a furniture maker from Chelmsford. The case was commissioned by the Chelmsford Cultural Council to be used to display works by artists. The case is 45″ wide and 2 feet deep. The display space inside is 27″ high with an adjustable glass shelf.